← What does sentence difficulty mean? I’ve read that Lexile scores predict the difficulty of a reading passage based on two things: word difficulty and sentence difficulty. 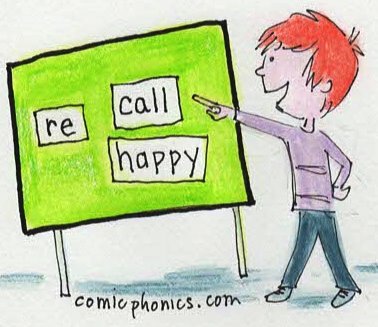 Skipping long words can be a sign of a struggling reader. How can you help a child decode such words? One way to help children decode big words is by familiarizing children with prefixes and suffixes. English is a language which creates new words from already existing words by adding a word part—usually a single syllable—before or after the original word. If the word part is added at the beginning of a word, the word part is called a prefix. If it is added after the word part, it is called a suffix. If children can recognize that a long word has a prefix or a suffix or both, they can segment that word both for pronunciation and for meaning. “Unwinding” can become un + wind + ing. “Un” means not, “wind” means coil and “ing” makes the word an action. Find a list of commonly used prefixes. Many web sites list about one hundred such prefixes, but I would start with a shorter list of ten or twelve of the most commonly used ones, such as bi (two), dis (the opposite), il (not), im (not) in (not), mis (badly), non (not), pre (before), re (again), sub (under) and un (not). Teach the child what each prefix means, giving her a word to help her remember each one, such as bicycle, disagree, illogical, improper, indirect, mispronounce, nonfat, prepay, resend, submarine, and unhappy. When she knows the meaning of the prefixes, write each prefix on an index card. Write two or three familiar words which could be paired with each prefix. Shuffle both sets of cards separately. Match each prefix with a word which makes sense, and ask the child to read the word and tell what it means. Or, you could choose two root words, one of which can be paired with a given prefix, and help the child determine which root works and why. Later, you could create a list of the words she has created. See if she can segment the words and tell what they mean. If she can’t do some of them, repeat the activity until she can. Gradually remove the words and prefixes she knows and add new prefixes and words until she knows several dozen prefixes. In a future blog we’ll talk about how to figure out suffixes. Suffixes are trickier because they sometimes involve changes in spelling the original word. This entry was posted in how to make learning fun, letter sounds, methods of teaching reading, phonics, reading strategies, vocabulary. Bookmark the permalink.